I would love to be able to shop like you do.. in bulk. And hopefully one day we can. We don’t have an extra deep freezer, so our space is limited. We also don’t have anything like Azure Standard :(. We are on a very limited budget as well! So, our groceries are bought once a week with a budget of 100.00 a week. I actually just sent my hubby to the dairy for 2 lbs of grass fed beef, local sausage and local honey. Ironically, no dairy! We do what we can and we eat pretty well. We get assistance from WIC and I’ve battled with not getting it because it’s grocery store milk, peanut butter, eggs, cheese, ect. But right now we need the help. And with the $12 fruit and veggie checks we do get help with produce! Like I said, I do the best I can with what we have and we are blessed! Sounds like you’re doing great! I love that WIC is now offering fruits and veggies checks too. I was so proud of them when I heard that! Yes, I was too! We get an extra 100.00 from our in-laws and that is what we use to help with lobuying local meats, butter, honey! That is such a blessing! Your site has been so helpful! I actually shared some of your recipes (taco seasoning mix and ranch dressing mix) to a friend of mine who’s husband is gf because he has MS. THey eat super healhty because of his illness. She was so grateful for the recipes! I sent her to your page! I know you have many recipes that she could use! Hang in there Crystal. It sounds like you are doing great. 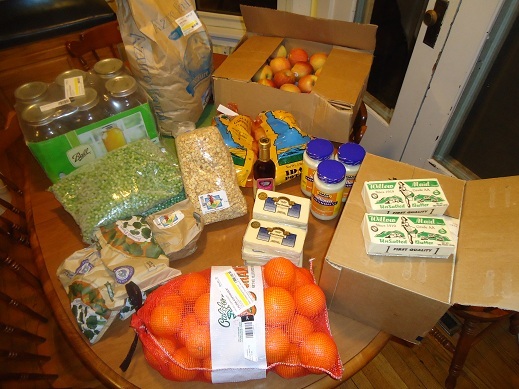 We started out with a very low food budget many years ago and would put some aside to buy one bulk item (like a large bag of organic brown rice or organic beans). Eventually we built up a stock pile of bulk things. Now, 25 years later, we are pretty much all bulk except for our dairy, fruits and vegies. I was able to do this last year on an extremely low grocery budget. It took a long while to get there, but even $5.00 allocated to your “pantry” will allow you to stock up on some items. We are choosing some grocery store items (milk, cheese, etc.) for various reasons as well. If I stress out about it, I know that’s not good for my health either. We are just starting to buy some things in bulk and we don’t have anything like Azure standrad sadly, and I’m still working on baking more homemade things, but that is an incredible job you did! I agree, I’m glad that WIC started in the right direction–I still think you should be able to buy local milk or just pay the difference to upgrade to organic milk, etc. I buy a lot in bulk as well and try to avoid the grocery store as much as possible. In December a local chicken plant had a fabulous deal with chicken quarters only $0.50 a lb then tenders and whole chickens $0.99 a lb. I bought a TON of chicken and they are in our deep freeze! My husbands parents give us a lot of pork each year and we swap pork for beef with a friend. We also hunt so that gives us venison which we grind and use in place of hamburger. Laura, do you have a “starting point” for your homemade mayonnaise recipe challenge? One of my cookbooks has a recipe for mayonnaise, and directions for making it either in a blender or with a mixer. If you’re interested, let me know and I’ll send you the recipe. Mary, I have looked into several different recipes, but if you have something to send me, please do! I really haven’t started yet…too many other recipes to try! Thank you!! I having been following your site for a few weeks now and love it and your recipes. I have tried many recipes and all have been great! Thanks for helping out moms with your ideas. Have you ever had tiny,tiny bugs in your bulk flour? If so what are they and what did you do? This has happened to me several times. (Maybe it’s an Alabama thing.) Now I store everything in the fridge and the problem has stopped, but there is only so much room in a fridge. Shellie, I keep all of my flour in our freezer. Usually in a ziplock back and its kept up well there. Well, I don’t buy bulk FLOUR…I buy bulk WHEAT, which I grind into flour…so that may be a difference. Here’s how I store my wheat before grinding it: http://heavenlyhomemakers.com/how-to-store-bulk-grain After I grind it, I either use it right away or freeze the rest until I need it. I’ve heard that it’s a good idea to put basil leaves with your grain to avoid bugs. Keeping a couple bay leaves on top of your flour supposedly keeps the bugs away. Works for me, never had bugs! Bugs will grow in flour, esp. in higher humidity. I have read that mint is supposed to keep them at bay. Also, putting your flour (or anything else with a tendency to get buggy) in the freezer for 4 days or so is supposed to kill off the bugs. I have also been keeping my freshly ground flour in the freezer until I use it. Honestly, the bugs aren’t going to hurt anyone. wheat, pasta, etc. I try to get as much out as I can, then just cook it up. And I also don’t advertise the bugs to the rest of my family. While living in FL we had trouble with weavils getting into any type of grain, pasta, etc. Sometimes these actually came in the generic pasta from the grocery store. Check for small oval while spots on the pasta. The weavils larva grow inside, then come out as adults to lay more eggs in all your other grains. Totally gross! Hi Laura. I love the way you shop! I have a few questions on your wheat order. How do you store your wheat? When you order it does it ship UPS or USPS? I would be very interested in stocking up as I have heard that the price of wheat will be on the rise. Thanks in advance. My wheat order actually comes on a big truck at my friend’s house. She has organized a HUGE truck delivery (which is how we get such a good price on the wheat). We order once a year and all the wheat (for like 60 families) comes on flats in a truck. Aha! =) I was wondering if that’s how you got that price. Good for you! If you’re near a Honeyville Farms retail location, they have awesome prices on bulk wheat. Online is expensive, but in the store a 50-lb bag is less than $15. Oh…the wheat from Azure is great, no complaints from me on that! 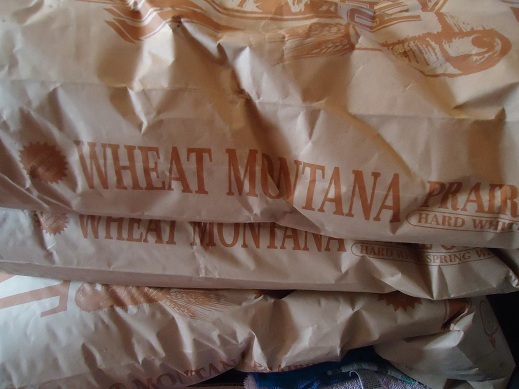 I buy it from Wheat Montana through this bulk order mainly because it’s EASIER! I buy my wheat once a year then forget about it. I don’t have to worry about it coming in or not coming in through Azure. I don’t have to think about whether or not I need to order wheat each month. It’s just easier to do it this way since I have the option. Azure wheat is great quality though, so if you have that option, go for it! I’m a fairly new reader here who loves your posts. I have been slowly transitioning over to similar methods over the last two years. I am also an Azure Standard customer who gets most meat from local farmers. This is all working so well for us. My grocery runs are smaller and smaller all the time. I also made a switch over to all homemade sourdough (whole wheat) bread since I seem to have stomach problems with any bread products baked with bakers yeast. I gradually began to feel much better. I rarely need to “pop some Tums” anymore. My daughter is lactose intolerant so we’re also drinking raw milk now which is SO much easier on the stomach. I have been ordering from Azure for a couple of months now and it is SO exciting when drop day comes! We finally got them to come down south to Texas! So much fun to see all that beautiful food. I love that butter, it’s so creamy and yummy. Thanks so much for this post! I just noticed that my green beans won’t be delivered from Azure this month so I wish I would have ordered the peas instead. Maybe next month. Anyway, I have a question. I’m trying to get away from a strict $400 monthly budget – sometimes I spend more and sometimes I spend less. The average needs to stay at $400 though for our current budget. I seem to be confusing myself with the money part. Previously we used cash for everything bought at the grocery store. Now that we’re not spending much at the grocery stores, writing a check works better for me when I pay the local people for food. Do you separate your grocery money from your other money so you always have an allocated amount for groceries? Ooh, I agree…the money part gets complicated. We used to keep a VERY strict budget, recording every single penny spent. After a few years, we got into a system of just knowing how much we needed to spend or could spend, without recording every cent. We’ve never done the envelope system…we’ve just had our budget outlined thoroughly on the computer. I think what I’d do if I were you, since your grocery money is going to local people, etct…I’d write down exactly what I’m spending and how (for groceries). Maybe subtract it out of your $400 monthly allotment, so that you know what you have left for the month. If you have anything left at the end of the month, put that onto your next month allotment. That means you could start with $456 for the next month if you didn’t spend all of the previous month’s money. Does this make sense? This is how I’ve done it in the past and it works well so that I can see it on paper exactly where I’m at in the budget. Makes sense – I’m a very visual person so I have to be able to see where I’m at. I have long bought bulk from Costco for as much as I can. But after seeing your Azure Standard post a while back, I went to check them out and wow, they deliver here! Just got my first order, but my ORANGES and CORN didn’t come in… I see you got yours. Bummer for me. Hubby had a stretch of overtime, so we had some extra cash to buy bulk wheat (just got a Country Living grinder with an unexpected check in the mail), lentils, brown rice, and some other stuff. Once I get more situated with storage, we’ll stock more. However, I am VERY happy to say a new Costco will be only about 5 minutes from us rather than 30!!! I hope to cut that trip down to every other month rather than twice a month. Would love to not have to go to the grocery store, too! I also discovered, through an Azure droppoint, that we have a produce delivery co-op very local to us, which I play to try this week if I can. That’s a weekly thing, so if I can do that weekly or semi-weekly, then Costco every 2 months for big staples, then Azure… I’ll be happy with my shopping. Just got to remember to put money aside monthly for bulk purchases. Our family is considering buying a Country Living grain mill with our tax return money! I’d love to hear how you like yours! Hi there – I started following your blog a couple of weeks ago and just love it! I have a question – I notice you bought some of your produce and potatoes in bulk. Do you just freeze it until you need it? Any special freezing instructions? I really appreciate all your insights. Can’t wait to try some of your recipes! If you’re an East Coast person, Azure Standard will ship to you but the UPS shipping is VERY expensive! If you are in VA, MD, DE, or NC try http://www.quailcovefarms.com/index.html They don’t have as much selection as Azure Standard, but the basic concept is the same and they are a Christian owned, family run small business! I really like getting my bulk foods from them, I buy bulk flour (saving for a grain grinder) and sucanat, raw vinegar, butter, chicken, and all sorts of other things from them. Anyone know of anyplace like Azure or Quail Cove Farms that will ship to Ohio? What kind of butter did you from Azure? What makes it different from grocery store butter? I usually buy Kerrygold, but it is expensive. Thanks. I get Rumiano Sweet Cream Butter, no salt. I don’t know the ins and outs of that company to know exactly what makes it better than store bought, but it just smells and tastes fresher. It seems more pure overall! I emailed Azure and asked them about their butter. Unfortunately now I can’t remember what they told me, but I know they contacted the company to ask them if their cows were grass fed or not. After I received the reply from Azure, I decided that the butter was worth the price. There’s definitely a taste difference between Kerrygold and Rumiano, but there’s no way I can fit Kerrygold into our budget. We go through a lot of butter! I’m sure if you email Azure they’ll be able to give better details. I get Kerrygold butter and Trader Joes. If you have one close, might be worth it to check it out. Though when we move there isn’t a TJs close, so I will have to travel a bit to get my butter, but certainly will stock up and make it worth the trip. Just a FYI, I bought Kerrygold before at a health food store and it was $5.99 a pound, at TJs it is $2.49 a pound! Our Kerrygold is $5.00 for 1/2 pound! Your prices are great. We don’t have a Trader Joes anywhere near where I live. Is $2.50 the normal price at Trader Joes?? We have one within 50 miles now, but haven’t visited it yet. Central Oregon Trader Joe’s is $2.69 for 1/2 pound of Kerrygold. I can’t find the rumiano butter on the Azure website? This is my first time ordering, so I admit to not knowing what I am doing! We just picked up our beef for the year from “our local farmer we love and trust” (my dad!). He gifts us beef every year so I feel really blessed. My husband works for a chicken processing company so we get our chicken from them when they have truck sales. They aren’t organic, but I know everything about the chicken from the moment they’re hatched to when they’re processed and I feel pretty good about that. The rest we get at our local co-op, or the grocery store. I’m actually surprised at how many things are available at our Wal-mart that I used to only be able to get at our co-op. OH, and Laura, I believe that would be MY box of fuji apples on your table… j/k! All I got yesterday was the in-season apples ~ so I’m glad I ordered a lot. And they are yummy =) My grocery store also just started carrying organic apples… and has had them on sale for $1.19/# the past 3 weeks. Isn’t God good!?! Oh, sorry I took your apples! We’ll think of you while we eat them!! That is awesome that your store is now carrying organic apples…and at such a great price! We’re Costco/and BJ shoppers. Azure doesn’t come to PA. We get some local fruit and veggies in the Summer. What we don’t get at Costco or BJ we go to a local grocery store. I had a HORRIBLE experience w/Walmart and will NEVER EVER step foot inside one again. YUP ONE TIME! It’s all it took! Our budget is around $700/800 a month. Yes, please do share what kind of butter it is! I’m looking for a good butter to supplement my small stash of raw butter. I used to buy Organic Valley, but now that they won’t allow their farmers to sell raw milk on the side I don’t feel good about buying their products. Their policy seriously threatened the raw milk supply for a lot of people. I get our groceries from local farmers, UNFI co-op, Country Life co-op, and just a few things from Whole Foods and a local natural food store. Our budget is $1200/month for 5, but I’m trying to decrease it. Milk itself is $133 per month and eggs $48 per month. I definitely envy the prices you get on raw milk! I get Rumiano Sweet Cream Butter, no salt. Do you know how your friend organized the truck delivery? I’m wondering if Wheat Montana has any coming my way that I could be a part of now that I have a Nutrimill. I buy their wheat at my local Wal-Mart supercenter, but it isn’t the organic (its the no chemical, no GMO) and I pay more than you do for the organic. I’m not complaining too loudly as it costs less by a huge factor than any other places I’ve found, but it would be great to buy the organic and I’m not afraid of 500 pounds at once! I’m really not sure how it all works…just go to the Wheat Montana website and I believe it may describe how to go about it, or you could contact them. You would just need enough people to divide the amount of wheat with so that it would be affordable! I just got my first order from azure!!!!! They just started coming to Texas. My question is if you know about how much you spend on food a year? I know it is very hard to tell monthly, but I’m curious if it would average out the same over a years time. I too have 4 boys–a little younger than yours, but they are growing fast. Thanks for all you do. Hmm…I’ve never figured it out for the year. But I guess since we spend an average of $500/month…that would make it $6000/year. That is how much I spend now, but it includes dog food, diapers and toiletries. do you lump those type of items with your grocery money? Or is that separate? We don’t need dog food or diapers, but toiletries, health and beauty items, detergents, etc. come out of a separate budget for us! Where in Texas do they come? Is it the Dallas area? I live in Amarillo and was hoping that maybe they come to the North Texas area. They do come to the Dallas area – there are several drop locations out this way now. You can email Diane at penningtonfam@yahoo.com to get more info about the locations. Thanks for the info. I just sent my email. I am in East Texas. I’m in Houston. Hopefully there is a drop in your area as well. Yep…it works great! I’m not sure what brands are available…I just us the Azure Standard variety. of corn bread mix/ mill because it is sooo expensive. I know it has to be field (or dent) corn instead of popcorn (which some mills can grind). The nutrimill does great with dent corn – I think I ordered mine from Honeyville but that was before we had an Azure drop point so I haven’t checked there. I do my groceries in a similar fashion that you do. 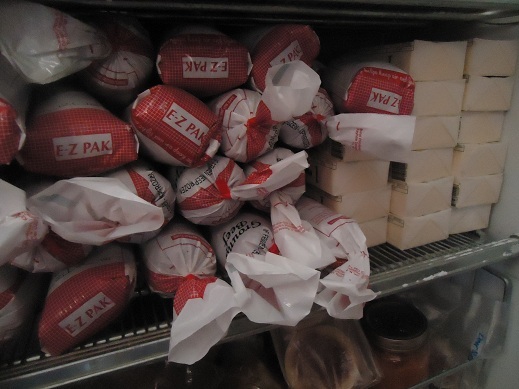 Monthly Azure order, game meat in the freezer, local milk and eggs, and Costco for their great organics in bulk. I noticed the raw cheddar you ordered from Azure and I just wanted to let you know, in case you don’t already know, that the 5lb. bulk block of white cheddar is cheaper per pound than the 1lb. block and it is so yummy. Thanks for all your wonderful recipes and information! Love your blog! Good to know. Is it the same brand? We really like the flavor of Landmark! What part of TX are you in? I live in Tyler and was just wondering if the drop site is close. I wish Azure was in Tennessee. But I do belong to a food co-op that I just got wheat from for .77 lb. It’s not as cheap as Azure but cheap enough! It’s at http://www.morningsidefarm.com and they deliver in middle tennessee. I’m still looking into buying a whole beef so that we can stock up. Don’t have a raw milk supply yet. Here in TN people are not as health conscious as I wish we were! Hopefully we’ll get on the band wagon soon. Our wal’mart barely has any organics. Kroger has a little more so I get things there weekly. I can’t wait to get my garden going soon! I’m going to look up your link to morningsidefarm. Thanks! close to health food stores or even grocery stores that offer good natural options. I wish that raw milk products were not illegal in my state. We just went in half on a pig, even though i cannot stand PIG. It has saved money on meat purchase. Ick. Though. Ick. Stocking up is something I wish I could do. But with the limited budget…I can only buy what we use in the week and nothing more. I do try to make a little extra of a dish when I can and freeze for a quick meal. BUT fortunetly, and thanks to God, we are moving to the country soon. We are going to be renting a house on a shared 7 acres with my husbands friend (his mom own the property and both homes). And the rent will be whopping $500 (plus a few free months). That is less than half we are paying now, but will be able to have more animals and garden and network (hopefully) with other farmers. I will also use the break in rent to help stock up on food. The only downside of the house, it is a tad smaller and it needs a lot of work. So we work on it everyday and have made great progress, my husband and his friend are working on the roof this weekend. It was bad..leaked alot. But we calculate and know it will be worth it given that we plan to stay awhile. Our order doesn’t come in until this week. I have mixed feelings. I’m excited always to get this, but dread coming home and putting it away. Wic is okay, my daughter gets it, but they only let her have low-fat milk and I think that’s not right for her two yr. old. I felt criminal when I poured him some. I told her that I couldn’t do it again and she ran out and bought him some organic until we could get better. I found that the apples at Azure are a bit cheaper if buying the apples in season in the 3 lb. bags. I never know which ones I’ll get, but so far have not been disappointed. Foods don’t always come in, have no idea why. It took me three months to get my sucanat. It was amazing how long I made my little bit last. I do what you do but we can’t order from Azure Standard because I am too far east. I tried a co-op but it is a lot of trouble so I go to Trader Joes and such but I can’t get much organic produce in bulk – do you have any alternatives for Azure Standard that would deliver east? So I was making Giant Breakfast cookies yesterday, and ran out of vanilla as I was making them. Ran to the local Piggly Wiggly, purchased a large bottle of vanilla extract, and arrived at home, only to find out I did not have baking soda, but baking powder, b/c I’d used all the baking soda in my baby girl’s bath for her diaper rash. My question, then, is do you stock up on herbs, spices, etc, as well? Or are those generally grocery store purchases? I’m still trying to acclimate myself to using SayMmm for shopping lists, and still need to get in touch with our local co-op for bulk orders. I stock up on herbs, spices, sea salt, baking powder and soda, etc. also. I usually buy these through Azure Standard. Of course, I don’t always keep track of when I’m getting low and I do sometimes run out and have to run to the store, but usually I buy a large amount and put a smaller amount into a labeled jar. Once I pour the last of my bag into the jar, I know to reorder! October to November, that sort of thing. I shop much like Laura, except no Azure here. :( We live 3 hours from a city, so I have 600 pounds of wheat, 125 pounds of oats, and numerous other bulk purchases stored. Honeyville Farms retail locations are an excellent source for bulk grains- much cheaper than online. Most of our meat comes from hunting or raising/butchering our own- we’ll be cutting and wrapping our steer in April! :) We grow a huge garden and can/freeze whatever we can. Raw milk is not available here, so it’s storebought until we can get a milk cow. Then I will make all our dairy products. I currently go to town every 2-3 weeks, but when we get a cow, I should be down to a monthly trip. Sam’s Club/Honeyville we usually make 3-4 times a year. I’ve been thrilled with our grocery budget going way down- raising/growing our own food has made a huge difference! I have been looking into doing some bulk grocery shopping. I would love to jump right in but think it is best if I start small. I was just curious though how you store the produce? I know you have a large family so it may not last as long as it would for my family of 4. I know for the apples I would use some to make applesauce and apple butter and we do love potatoes but just not sure how/where to keep that many. In general, I only order enough fresh produce to last us for one month. If we happen to not be able to go through it all…I can the extras or freeze them or make them into something (like apple pies!). Regarding the apples, we generally buy several boxes in the fall and store them in the garage (up off the ground). The variety of apple we get (Idared) stores well and even though the apples freeze sometimes in the winter, I still have edible (slightly soft) apples into June. Unfortunately not this year. We tried a new variety and they spoiled quickly. I wanted to respond/encourage Samantha but the site wouldn’t let me reply directly to her comment. We live in a trailer too, so I understand having to get creative with bulk food storage. We have an enclosed patio and though it’s not the ideal place for one, it holds an upright freezer we found on Craigslist for under $100, and it saves us a few thousand dollars a year. We have a very small coat closet inside the front door that we converted for food storage by adding shelving (from free wood on Craigslist). Like Laura, I store most of our food in glass jars. I purged our kitchen and dining room of the dishes and gadgets we rarely use so I could store more jars. I gave up trying to hide all the food in cabinets and pantries, and some of the jars look great out in the open with their different colors. I’m always looking for small space storage ideas because buying food in bulk is one of the best changes our family has made. Do you know any co-ops like azure that deliver to Georgia. I have found a couple of small ones, but not one that you can order like you can from azure. I wonder how you make all of this stuff all the time…it takes time…I make a lot of stuff but you really make a lot of stuff. It is amazing to me! I’ve been trying this thing lately where I MUST spend at least $20 on produce at our farm co-op every week (prices are half that of the grocery stores too!). I scramble to figure out how we can use it all up without waste. I am joyfully learning though! The surplus of veggies in our lives are really showing on our waistlines and in our energy levels too! http://www.unitedbuyingclubs.com delivers all over the east coast. They have everything! Go to their website to find a drop in your area. I belong to the United (UNFI) co-op as well. They have bulk for grains, beans, sucanat, etc. And they have all the kinds of things you can get at Trader Joe’s, but for a much better price. They have dairy and frozen items as well. As far as I can tell, they don’t have any fresh produce though. I would love to belong to a co-op that has fresh produce, but Azure doesn’t deliver to Ohio. Oh, I forgot to add that I bought Organic Valley raw white cheddar cheese in the 5 lb. block from United, and shredded it in my food processor and froze it in 8 oz. portions in Ziploc bags. This has come in handy for so many recipes. For those who live in the Eastern part of the states. I get bulk food from Frankferd Farms you can get the information at http://www.farmferd.com. They service PA, WV, parts of OH and VA. We have a homeschool co-op that we order together and get a better rate. I live in South West Virginia. We also use Azure. United Natural Foods also delivers to our area. We started buying in bulk over 10 years ago. My advice is to just simply stock up on sale items. Instead of 2 cans, get a case or so that way you never have to pay full price for that item. We only by sale items unless it is from our meat guy or our milk gal. By buying extra while it is on sale you can usually store enough till the next time it is on sale. We cook from what we have, not what sounds good. Like Laura we avoid the trips to the store as much as possible, this prevents spontaneous spending because something sounds good at that moment. We save thousands in a year just by only getting sale items and getting everything in bulk. If I shopped just for a week or a couple days at a time I would have to go back to work outside of the home to pay for the difference it would cost us. Do you have to have some kind of business or wholesale license to buy from United Natural Foods? I see they deliver close to my area, but it doesn’t look like just anyone can order from them. Your right about buying ahead on sale items. In it’s way, it makes meal planning a bit easier for me. This is our pantry/freezer items so this is what we are going to make. depending on group size you work every other or every third time. weekly meals. Call the company and see about setting up a buying club. I am SOOO excited right now! I have been following you for about a month now, and love love love your recipes and philosophies! I usually have to go to three or four stores every week to purchase whole foods – although usually not organic, due to the price – every week. After this post I decided to check again to see if Azure Standard was delivering to Colorado Springs yet, and THEY ARE!!!! YAY YAY YAY!!! This saves me time and money, plus I can now afford organic:) Thank you so much for sharing them with us. Now I just have to find people to share a bulk wheat purchase with…once I started cooking from scratch my family just doesn’t like store bought baked items anymore. I am also so excited that Azure Standard has a drop in Amarillo on Soncy Rd.!! I also see that they sell wheat berries. In the past I have just ordered Praire Gold from Natural Grocers and they cost around $20 for 25 lbs. I see that Azure also sells them for a whole lot less. Have you tried them? What is the difference in Hard White Winter Wheat and Soft White Winter Wheat? Soft white winter wheat is considered pastry flour; it is not suitable for yeast breads, only for quick breads. I have tried both and don’t care for the soft white wheat- it seems to make everything very crumbly. I’ve gone back to using hard white wheat for all my baking. I’ve tried Azure Standard’s wheat and it’s great! Does anyone know of a co op drop group in South Carolina around the Greenville/Spartanburg area? Just out of curiosity, where do you live? The state? The south is a little hard to figure out all the new places that have more organic meat, dairy, produce, co op bulk buys, etc…Can you point me in a direction? I live in Nebraska. Look up LocalHarvest.com to see what might be available where you are! We have been buying from Azure Standard out here in Washington for awhile now and even though I don’t always get all of my items, I think the trade off is well worth it. We love, love, love them and appreciate you, Laura for turning us on to such a treasure. Thanks! I feel like we have so much in common. I also have four boys who are ages almost 5 – almost 13. I have a question about your homemade peanut butter that I’m sure you’ve answered before, but I haven’t found it. Do you use roasted, unsalted peanuts or salted peanuts? Laura, I think you should look into setting up a tab that people could add places they buy organic foods from. That seems to be a frequent question you get. Maybe divide it into regions. Just a thought, I am sure it would take a little (or a lot) of work. In Denver we use Golden Organics. They sell bulk organic grains and lots of organic spices and sweeteners. I also read that they deliver, I Do not know where though. We just bought organic sucanat and I was wondering, is it more like brown sugar or white sugar? I noticed you seem to interchange them, does sucanat work for both types of sugars? That’s a good idea…I’ll have to look into seeing how I can do that! Sucanat replaces white or brown sugar. I use it anytime a recipe calls for either one. Sucanat really has a look all it’s own and doesn’t resemble white or brown sugar really. I have also been buying the Azure Rumiano butter. However, it doesn’t really give a guarantee of coming from pastured cows, and Rumiano’s website says nothing about their butter. Have you researched this? I notice you buy unsalted. Could you explain why? I decided to answer my own question. I e-mailed Rumiano and found that the butter they sell to Azure is not even theirs, and is made by a huge dairy co-op, California Dairies, which makes no claims to pastured cows. I am so disappointed that I’ve been buying this butter that is in fact no more healthy than what I could buy at Aldis. Here is the quote from Rumiano: Thank you for contacting us regarding our butter. I apologize for the confusion but we distribute butter to Azure Standard from another manufacture, which is California Dairies Inc. The butter is labeled as Rumiano is not made by us. We do have pasture based butter that is sold in our retail store at our plant and can be purchased by calling our toll free number Monday-Friday 9-5:00PM at 866-328-2433. All of our milk comes from small family owned dairies that allow access to pasture year-round. The cows average 300+ days on pasture and you can see it in the color of our products with the rich natural yellow color. I’m not aware of any 100% pasture based dairies other than in New Zealand, though we are close because it doesn’t snow here. We also have organic cheese and butter products which are the first in the world to be Non-GMO verified. Please check us out on http://www.facebook.com/rumianocheese for more information, articles, and photos about our company. I buy unsalted because I think most recipes call for that. If you use salted you have no idea how much salt is in your recipe and whether you should add more or skip it. I prefer to choose if I use salt and what kind and amount. That’s my personal thoughts though, I’m sure there are more expert opinions out there. Since I’ve been on a whole foods diet I’ve used only celtic salt for myself. I hadn’t used salt for years believing it would cause me to have high blood pressure. My mother, sister and brother are all on heavy BP meds, and I was working hard to avoid that. I was keeping it maintained somewhat, but a month ago when I had an allergic reaction and the paramedics arrived, one good thing. My blood pressure was 125/80 and I’m 54. I really believe the celtic salts and my whole foods diet has done the trick. The bad news, I’m allergic to raw honey and bee propolis and I just had received my 1 gal. of raw honey from Azure. I’m laughing at the irony, but so sad when I look at that honey on my pantry. And I’m starting a container garden this spring too-first time I’ve ever gardened and I’m so excited to try it! I do something similar, except slightly cheaper. I hit loss leaders at stores, hit the u-pick and other local farmers hard in season, get bulk deals like a 1/4 cow or 40-80lbs of fresh chicken at a time, and use my freezer, canners and pantry in a way that could either make my Depression-era grandmothers proud or a little afraid. :D It’s nice to rarely run out of something – last minute grocery store runs aren’t an emergency like they once were. when you make your mayo – try adding lime juice instead of lemon. it makes a wonderful tasting batch of mayonnaise. you’ll just love it. Do you have a back-up system for your freezers? I was doing really well stocking up on food and freezing it and then the breaker on the freezer was tripped and we didnt know about it until it was too late and lost everything. Then, just as I started to get a good stock going again, we had an ice storm last week. I would love to buy in bulk, but only have a small freezer above the fridge. We are very energy efficient in the way we run our home, which is largly why we don’t have a large freezer. Does anyone have comments on how much they think it costs them per month to run a large deep freeze? I don’t really have numbers, per se. We had been borrowing an old large chest freezer from a friend, and noticed a sharp increase in our power bill (dare I say $20-$30/month?). We then decided that we should afford to purchase a new, energy efficient one, and it made a big difference. Couple an energy efficient freezer with the savings of being able to buy in bulk, and I think it’s worth the plunge. I get organic butter at Costco for $6.89 for 2 lbs. Pretty good price! We shop like this too. A little Azure, a little farmer’s market, a little local food co-op, a little grocery store. All supplemented by our gardens and chickens and goats. We are still working on trying to figure out a budget and make it work. Right now we are in a long term stock up phase and within the last few monthes have mostly given up eating out and boxed type convenience foods so we are still working it out as well as trying to get used to making nearly all meals from scratch. Sounds like you have it all down pat.